Did That Really Just Happen? A Whole Semester? Really? Hello readers! I hope that you are enjoying the holiday season. It’s been a while, hasn’t it? Well, as always, not without just cause! I promise you that much. It is tough to keep you all updated when there is literally SO much going on! Senior year is no joke, my friends. Okay, let’s get rolling. 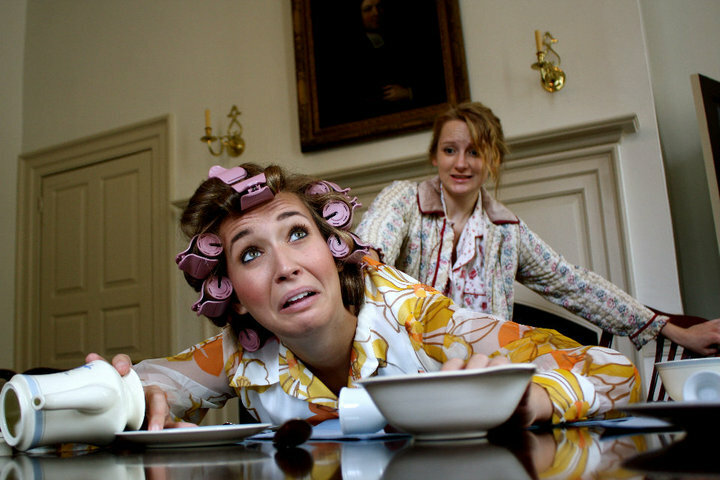 This semester I had the pleasure to play Sarah in Alan Ayckbourn’s, “Table Manners.” It was the first main stage production of the year, and if you logged onto mywm, I’m sure you got a lovely view of my face in close up with a head full of curlers! It was an incredible production to be a part of, directed by the one and only Christopher Owens. 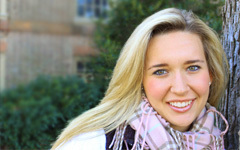 We also were lucky enough to have his wife, the talented Tamara Johnson, as our dialect coach. Yes, the entire play was done with British accents. Find me on campus and I promise you mine is pretty spot on! We played to sold out audiences over parents weekend, and I’ve attached some photos from one of our press shoots for your viewing pleasure. If you follow me at all on facebook, you might also know that I was in a movie this semester. But if you don’t, I WAS IN A MOVIE! Okay, it wasn’t the worlds biggest part, and I might have only had to sing and not actually say any lines. But I did get to have the opportunity to watch stars from Gossip Girl, Bones, and Law and Order strut their stuff. Learning from them, and learning the ins and outs of how a movie is made was awe inspiring. It was really fascinating to be a part of a production and learn just how long it takes to get it right. (It’s a long time.) So, lesson learned, patience is a virtue in this business, and I’m glad I learned it early on. It was an incredible experience, and I got to film the movie in Richmond, Va with a fellow W&M student and theatre major Francesca Chilcote. I couldn’t have asked for a better partner in crime to film my first movie with. Hollywood, here I come! Other than that, I have been working really hard to get all my auditions ready for graduate schools. I am applying to seven, yes seven, schools; which means seven different auditions. Oy vey. I’m tired just thinking about it! But with the help of theatre professors Christopher Owens and Richard Palmer, I have my monologues picked, and applications turned in early. There is still a lot of work ahead of me, but the fact that professors were so willing to help me with everything from monologue selection, to editing my personal statement, to giving me tissues when I got overwhelmed with the prospect of actually having to graduate, really made me appreciate the school and department I have spent the last three and a half years at. A whole semester has gone by, and I can’t believe I didn’t update you sooner! The New Year is upon us. I will be back to write about (hopefully) triumphant auditions, and much more exciting opportunities that are ahead. One semester left, and I already don’t want to leave. Here is a picture of me and Miden Wood, who played Annie in the show.